Our little fellow here has had a wonderful night out, he has been drinking his whisky, but he has not lost his stash of gold or his unopened tiny bottle of Whisky. 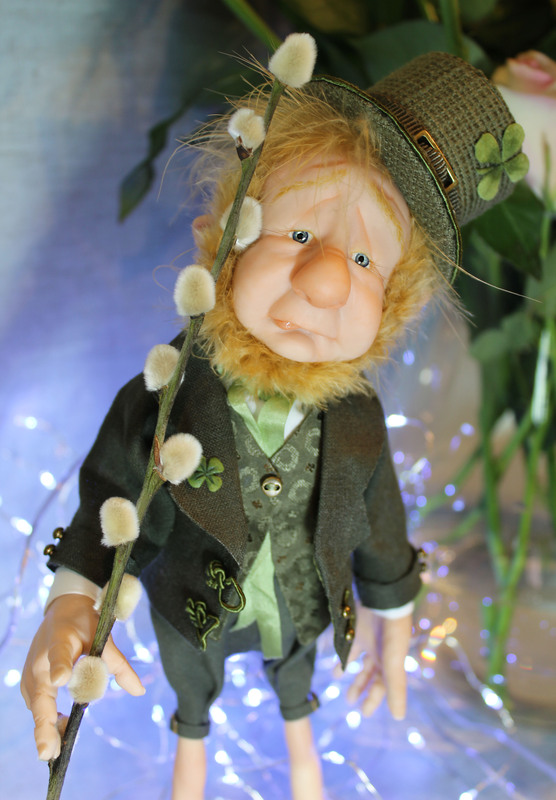 This lucky Irish Leprechaun measures a proud 26.5 cms (10.5 inches) from his feet to the top of his hat. He is a polymer clay creation over a strong wire armature which allows you to arrange him in several poses. His arms can bend and his wobbly head can turn from side to side. His arms are floppy and just dangle, just like a real little drunk man! He has such a gentle little beguiling face with the softest sad eyed expression that will melt your heart and make you want to hug him. He has big fat sturdy shoes for balance and his attire is pure linen, cottons, luxurious taffeta silks, hand embroidered buttonholes and metal buckles. His jacket and waistcoat are able to be opened and closed but they are attached so as not the be removed, I think he would prefer to keep his clothes and hat on! His bottle is a genuine green glass whisky bottle, with a removable cork stopper. Little Sprig Snapdragon Leprechaun has his very own handmade lucky four leaf clover on his hat, and a tiny handmade one on the lapel of his jacket!